The virtual world tour is based on REAL World Tour in 2017, which occurred from March to September, here is the event website http://www.flydc3.net/en/. 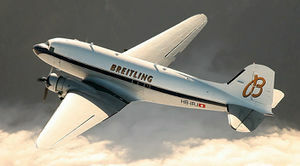 And Breitling also has a website for this event https://www.breitling.com/en/airtime/breitling-dc-3/. For more photo and video you can check https://www.facebook.com/BreitlingDC3WorldTour/. The DC-3 HB-IRJ flying under Breitling colors was delivered on March 12th 1940 to American Airlines under the name ‘Flagship Cleveland’. Between 1942 and 1944, it was hired out to the US military, which based it in Europe. After being bought up in 1949 by Trans Texas Airways, it was subsequently owned by several North American airlines. In November 2008, the pilot Francisco Agullo and a group of friends, supported by Breitling, decided to make a legendary DC-3 fly again in Switzerland and in Europe. After a lengthy search around the world, they ‘fell in love’ with this Priscilla N922CA, based in the United States. Their interest was sparked by its exceptional condition, as well as by its rich civilian and military history perfectly embodying the significance of the DC-3. The Breitling DC-3 was then restored, adapted to European standards, and brought back to Europe. Since 2009, it has been participating in a number of air shows in Europe as well as in events organized by Breitling. 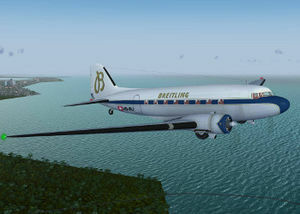 Operated by the Super Constellation Flyers Association, based in Switzerland, it can accommodate around 20 passengers in its non-pressurized cabin and is equipped for flying under instrument flight rules. Like the Breitling Super Constellation (one of the world’s two remaining ‘Super Connies’ in flightworthy condition), the Breitling DC-3 vividly illustrates Breitling’s determination to safeguard the finest gems in aeronautical history. En 2017, Breitling has decided to launch its DC-3 on a grand world tour in stages, dotted with a number of stopovers providing opportunities to organize events and take part in air shows. Selected passengers will enjoy the privilege of being welcomed aboard for certain stretches. Having taken off from Geneva in March 2017, the plane must first fly to the Middle East, India, South-East Asia, China and Japan, before crossing the ocean to begin a grand tour of the United States, returning to Europe via Greenland and Iceland, and ending its epic journey in September at the 2017 Breitling Sion Airshow in Switzerland. At the venerable age of 77, the Breitling DC-3 is the oldest plane to do a world tour and this fresh claim to fame will be added to the already long list of its feats to date. We will use Douglas DC-3 for this event, please make sure you have knowledge about basic IFR skill. Please note that there is NO such DME receiver on this aircraft, and NO auto throttle devices, so please do read Douglas DC-3 wiki page carefully and learn how to fly it. And also I am working on improve the aircraft, now equipped with a DME receiver so it will helpful for this world tour, and I would make a new flap indicator and ALS effect improvement https://github.com/tonghuix/Douglas-Dc3. Place it onto your aircraft directory. For navigation, it is a big challenge that using 'VOR by VOR' navigation, that means you can fly from one VOR (or NDB) station to another VOR (or NDB) until to destination. Also, you can use route manager and fly by FMS/GPS, though it may less fun :). Due to Douglas DC-3 only flies hundreds mils (less than 1000), so you may have to 'refuel' mid-air for some long haul route. 11 Dr. Babasaheb Ambedkar (VANP) Shah Amanat International Airport (VGEG) 717nm 4h52m, outer marker is on the VGEG's runway! 12 Shah Amanat International Airport (VGEG) Chiang Mai International Airport (VTCC) 453nm 2h58, VTCC covered by surrounding terrain! 13 Chiang Mai International Airport (VTCC) Phuket International Airport (VTSP) 638nm 4h10m, note that VTSP rwy27's LOC has a 1.14 deg offset, it's not a bug, see chart. 31 Ted Stevens Anchorage International Airport (PANC) Juneau International Airport (PAJN) 496nm 3h08m, It is a challenge landing on PAJN, caution terrain and bad weather. 36 John Wayne Airport (KSNA) Page Municipal Airport (KPGA) 370nm 2h35m, Great Canyon will on the route, enjoy it! 48 Québec City Jean Lesage International Airport (CYQB) CFB Goose Bay (CYYR) 576nm 3h51m, CYYR covered by trees!! 52 Wick John O' Groats Airport (EGPC) Edinburgh Airport (EGPH) 151nm 1h34m, some building near EGPH and Glasgow are floating in the air!! 56 London Biggin Hill Airport (EGKB) Paris–Le Bourget Airport (LFPB) 170nm 1h20m, La Tour Eiffel on the way of approach to LFPB! This page was last modified on 29 January 2018, at 10:34.